With the recent reports about the risks of using Ibuprofen regularly, I decided to look at some alternatives. I’ve heard a lot about turmeric having anti-inflammatory properties. If you don’t have any in your cupboard, turmeric is a yellow spice often used preparing Indian foods. Here’s what I found. The only adverse side effect I could find was that turmeric can be difficult for some to digest. It was suggested that this is easily remedied by adding a little black pepper to it. Some herbalists believe that black pepper improves turmeric by making smaller doses more effective. Add about 1/2 teaspoon of ground pepper to 1/4 cup of turmeric for best results. A study published in the journal Alternative and Complementary Medicine reported a clinical trial was done with 109 patients who suffered from osteoarthritis of the knee. Some patients were given 800 mg of ibuprofen, while others received 2000 mg of turmeric daily, for six weeks. They tracked their pain while doing several different activities, including walking and climbing stairs. The patients taking the turmeric had better results, showing greater performance and a higher level of satisfaction than the ibuprofen group. Prevention of cancer and preventing further development in existing cancers, including prostate, breast, thyroid, colon and melanoma: Preliminary studies found that curcumin can inhibit tumor cell growth and suppress enzymes that activate carcinogens. It’s recommended that we buy organic ground turmeric or fresh turmeric root from the produce section (found in natural food stores, like Whole Foods). Otherwise, we might get a product that has been chemically enhanced or treated with conventional pesticides. There are numerous recipes out there using turmeric. I’ve selected a few simple ones to try myself and will share them here! Previously, I’ve blogged about tea, honey, soup, salads and roasted vegetables – Turmeric can be used to improve the benefits of all of these! Turmeric Tea: Bring 1 cup of water to a boil and stir in ¼ teaspoon of ground turmeric or fresh grated turmeric. Simmer for 10 minutes and strain. Stir in a little honey or fresh lemon juice for added flavor. 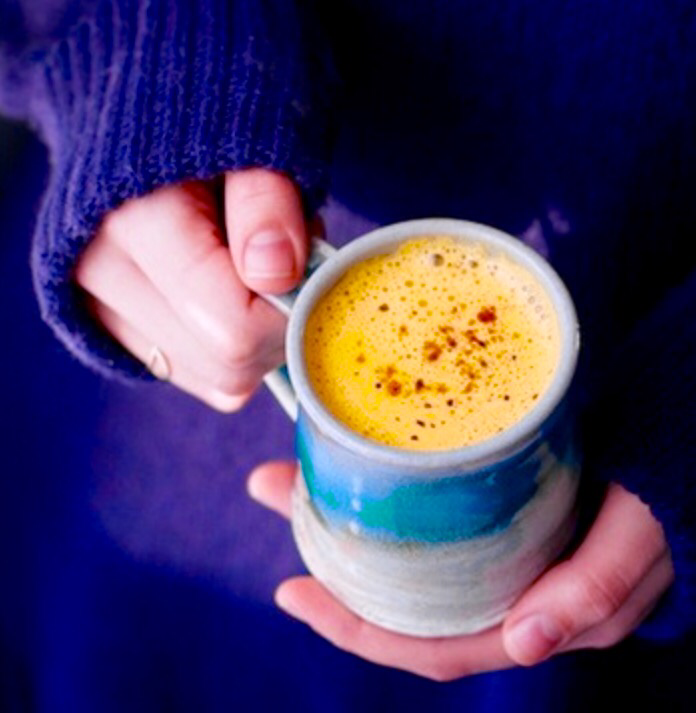 Turmeric latte: Heat 1 cup of milk (dairy or non) in a sauce pan. Add ½ teaspoon turmeric, ½ tablespoon ginger and ¼ teaspoon vanilla extract. Over medium-high heat, whisk vigorously until frothy and slightly thickened. Do not allow to boil. Sweeten with a little honey or maple syrup, if desired. Curry Powder: 8 parts ground coriander, 4 parts ground cumin and 1 part each of turmeric and cayenne pepper or paprika. (Decrease the cayenne and use paprika instead if you don’t want it spicy). Store in a glass container in your pantry for up to 6 months. Use in sauces or as a rub. Roasted Veggies: Toss some fresh vegetables with a dash of olive oil and turmeric, along with any other seasonings you like. Roast at 400 degrees, tossing once until done, usually about 30-40 minutes. Cold Remedy: Mix 1 tablespoon of ground turmeric with 7 tablespoons of raw honey (this is known as Golden Honey). Dissolve 1/2 teaspoon of this mixture in your mouth every 3-4 hours. Easy Peasy method: Sprinkle or shake some turmeric in your smoothie, on your salad and in your soup! Small amounts will add no flavor (but might add a hint of yellow!) Experiment to find what works best for you! Next > What are antioxidants? Cool!! Now can you tell what an antioxidant is, what does it do for me, how do I find them and can I put them in s recipe has only 3 ingredients? Stay tuned…. It’s on my list. Maybe tomorrow? I’ve been taking turmeric for several months now and feel an improvement. I take iit in the form of a capsule called Curaphen by EuroMedica. Thanks, Connie – Good to know!